Delaney Brooks is a twenty-something girl who is out of control. Oh she’s not drinking or drugging – but she’s irrespobsible, immature and unfocused. So much so that after crashing her car and being evicted, she’s back with her parents who have said no more. They are tired of the constant worries and struggles as they watch her make one bad decision after another, and now seems to be inert. So an ultimatum is set: she must find a job and an apartment tout suite. The one thing that has ever captured Delaney’s attention is art, her millennial approach to being “herself’ and expressing herself in all of her arty-ness is a hallmark of her approach to a meandering path to life, always to her own drum beats. 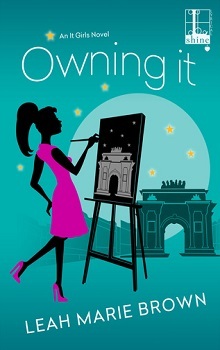 On a whim she applies for an internship at a prestigious Paris Gallery, and the position is hers. YAY Laney – off she jets to Paris, determined to show her parents (and the world) that she is someone to contend with. An interesting premise that would take a delicate balance to bring this airy character to fruition and not caricature. Unfortunately for me, Laney’s text-speak, her inability to seem to focus and a general over-indulgence in pop culture references, a tepid romance and a breezy (if wholly touristy view) of the city let me down. Laney came off as immature, not safe to be allowed out on her own without a warning label, and while I saw glimpses of her knowledge and appreciation of art and the pieces in the gallery took a far back seat of the bus to her immature communication and the fact that I barely passed a sentence without visualizing her face as an emoji. Not having read earlier books in the series, I can’t say if this flat characterization and missing the high bar from promise of premise to actuality is the norm, or if as the latest in this series the story fell a bit flat – but I do know that it wasn’t for me. Suitable for fans of millennial characters and those who need, at both ends of the story, some significant development and growth.